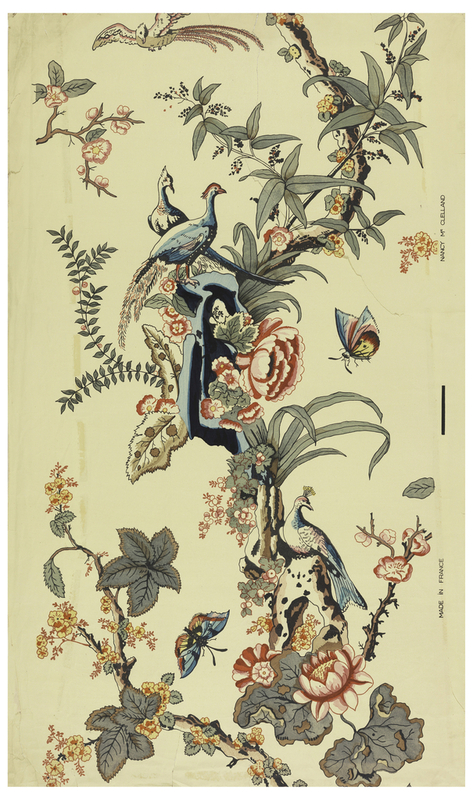 Full of life, movement, and color, this design for a wallpaper is a reproduction of Chinese wallpaper by one of the leading antique and wallpaper scholars of her day, Nancy McClelland. McClelland is known for her attention to detail and meticulous research that went into each of her reproductions. She was also a successful interior designer and author as well as the first women to become the national president for the American Institute of Interior Decorators, which is now known as the American Society of Interior Designers. Dynamic forms of birds and butterflies dance through the underbrush of this composition as richly colored depictions of flowers capture the eye. To create contrast and variance in movement, perched birds are seated just above butterflies in flight. Adding to the enchanting naturalism showcased in the paper is the asymmetrical quality of the branches that wind their way up this piece, reaching towards the unseen sky. Even with its attention to biological and vegetal details this paper successfully juxtaposes naturalism with abstraction as the sprawling foliage seemingly appears out of thin air and continues on into nothingness.